Growth and Underinvestment is the archetype that brings special attention to planning for limits. Archetypes are a classification of systems behaviour. They give us a relatively easy tool to spot and forecast behaviour and develop a response plan for instituting changes to meet objectives. Archetypes were first identified in the 1930s by biologist Ludwig von Bertalanffy and expanded by Peter Senge in his books The Fifth Dimension and The Fifth Discipline Fieldbook. There are only 16 unique archetypes and two are the basis of all the remaining 14, the balancing loop and reinforcing loops. All of the other archetypes are combinations of these two structures. Primarily archetypes are useful for formulating plans. After planning and formulating the means by which managers expect to reach their organizational ends, the archetypes can be used to test whether all conditions under consideration may be modificating the organizational structure in the way to produce the archetypal behavior. If managers will approve, before the changes are adopted and embedded in the organization’s structure they can take remedial action. Also archetypes are useful for receiving the “nature” of the problem and for offering a basic strategy or foundation upon which a model can be developed and improved. Almost all archetypes are not sufficient models in and of themselves. They are general and can't indicate important variables that are part of the real system structure of a specific organization. It is a problem for managers to determine specific leverage points where changes in structure can achieve sustainable changes in system behavior. The Growth and Underinvestment Archetype is one of the common system archetype patterns and a part of the system dynamics discipline. System Dynamics is a perspective and set of conceptual tools that enable us to understand the structure and dynamics of complex systems. System dynamics is also a rigorous modeling method that enables us to build formal computer simulations of complex systems and use them to design more effective policies and organizations. Together, these tools allow us to create management flight simulators-microworlds where space and time can be compressed and slowed so we can experience the long-term side effects of decisions, speed learning, develop our understanding of complex systems, and design structures and strategies for greater success. The Systems Archetypes describe common patterns of behavior in organizations. As diagnostic tools they provide insight into the underlying structures from which behavior over time and discreet events emerge. As prospective tools, they alert managers to future unintended consequences. Collectively they challenge managers to consider the merits of fundamental solutions by making time an explicit variable in decision making. A Growth and Underinvestment structure builds upon Limits to Growth where the growth inhibitor is part of another Balancing Loop with an external standard and delay. The real nasty thing about this structure is that the two balancing loops form a single reinforcing loop which inhibits growth. The “Growth and Underinvestment” systems archetype consists of two types of feedback loops. A feedback loop occurs when a change in something ultimately comes back to cause a further change in the same thing. If the further change is in the same direction it’s a positive or reinforcing loop. If it’s in the opposite direction it’s a negative or balancing loop, also called a goal-seeking loop. Positive feedback loops occur when an initial change is reinvested to further that change in the future. The bigger the initial push, the bigger the consequential push. Reinforcing loops get things moving. They build momentum. When change is agile or growth persists, reinforcing loops are often at play. - When immigrants settle in a particular part of a foreign land, they build infrastructure and provide services, creating an environment that in turn attracts more people like them. This leads to the formation of large homogenous ethnic neighborhoods like China town in San Francisco. - When a company’s product is successful, people will talk about it and through word of mouth, the product will become even more successful. Negative feedback loops are circles of cause and effect that counter a change with a push in the opposite direction. The harder the push, the harder the system pushes back. Balancing feedback loops bring stability or stubbornness to a system (depending on how it is perceived), so they are essential and pervasive. Often in a balancing feedback loop, there is some sort of implicit or explicit goal. When the distance between your car and the car in front of you increases you accelerate, closing the gap. When the distance between you and the car becomes less than your desired distance (you’re to close) you will decelerate, either letting the friction of the road slow you down or applying the breaks. - When the internal temperature of your body increases, you sweat, and as that sweat evaporates from the warm surface of your body, you cool down: balancing the initial increase. When you are cool, you sweat less, so there is less sweat to evaporate and it drains less heat allowing your body temperature to rise. At the same time, if your body temperature drops you may start shivering, releasing more heat to warm your body, balancing the initial decrease. In biology, the concept of homeostasis is all about balancing feedback. Cells and living organisms and humans have evolved myriad mechanisms for keeping themselves and their immediate environments stable. - When a company has too much inventory supply that it needs to get rid of, it cuts prices to attract more customers to buy their product. This in turn leads to the supply depleting. 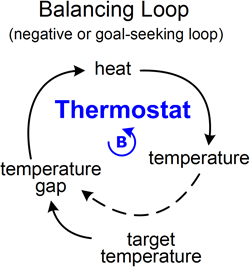 Is a variation of the standard balancing loop. There are one or more delays in the structure which are responsible for producing a very different behavior pattern than with the standard balancing loop. When the current water temperature is less than the desired water temperature it influences the person to add to the ratio of the hot water to cold. It possible by increasing the hot water or decreasing the cold water. Because changing the faucet position doesn't result in an immediate change in the current water temperature there is a tendency to believe that the ratio isn't correct so the next decision to turn the faucets more in the same direction. When the delay finally catches up, the current water temperature is much hotter than the desired water temperature so logically adjust the faucets in the opposite direction. This action still adds to the ratio of hot water to cold, just less than before. Depending on requests of person and his reaction on the situation, it could take some time before the water temperature will be normal. Archetype consists of three loops. 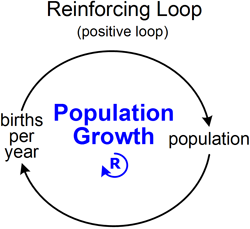 In the first loop (upper left), as the organization's Growing Action increases, Demand also increases in a reinforcing loop. However, in the second loop (middle) as Demand increases, the organization's Performance must also increase to keep pace with the Demand (a classic “supply and demand” relationship)— and by satisfying that Demand, it declines in a balancing loop. 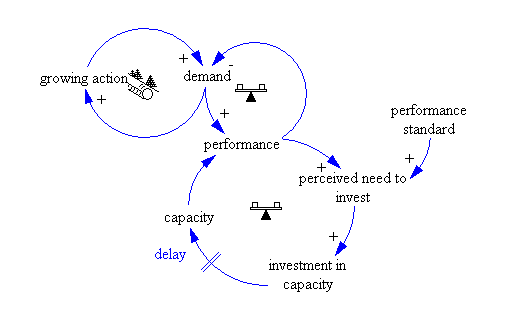 The third loop (lower right) describes the organization's Capacity, and shows a balancing loop in which current Performance is compared to an existing Performance Standard. As Performance declines, the Perceived Need to Invest increases, so Investment in Capacity is increased, and after a delay, Capacity increases. Increased Capacity, in turn, then increases Performance. Again, it is the time delays that ultimately make it easier to reduce the Growing Action than to make the required Investment in Capacity. We will see that “Growth and Underinvestment” has at its heart a “Limits to Growth” (or “Limits to Success”) archetype. 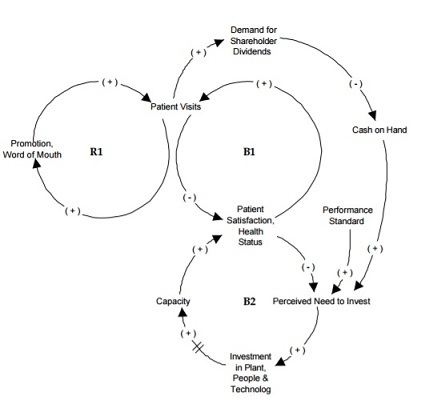 The extra loop (B2) illustrates how failing performance can be used to justify underinvesting in the very capacity that is necessary to avert the limit to growth. The Growth and Underinvestment archetype builds upon Limits to Growth by explicitly addressing a firm’s need to invest in its own resources, capabilities and core competencies. A growing action seeks to stimulate and reinforce demand while the firm’s current performance level may behave as the limit to its growth. Similar to Limits to Growth, if current performance is adversely affecting demand, no amount of growing action will overcome customers’ reluctance to reward the organization with sales. 1) Performance standards are constant. This can be temporarily or it can be a tendency that has developed over long periods of time. 2) When the firm’s current performance combine with the standards this leads to a corrosive influence on the perceived need for investment. 3) Declining of performance leads to declining revenue which in turn reduces cash available for investment. 4) Even if the organization makes an investment, if it has not expected the delay in bringing the increased capacity and capability on line, it may turn out to be a long run for a short slide. The correct signal that archetype is at work is when data shows performance which declines and grows at the same time that the rate of investment is slowing or falling. If demand outstrips capacity, performance can suffer and hurt demand. If this dynamic is not recognized, the decrease in demand can then be used as a reason not to invest in the needed capacity. This archetype can be used to ensure that investment decisions are viewed from a fresh perspective, rather than relying on past decisions. This archetype applies when growth approaches a limit that can be overcome if capacity investments are made. If a system is stretched beyond its limit, it will compensate by lowering performance standards, which reduces the perceived need for investment. It also leads to lower performance, which further justifies underinvestment over time. Structure where the growth inhibitor induces a decline of the standard over time is a A Growth and Underinvestment with a Drifting Standard. This structure is a variation of Growth and Underinvestment structure. The growth inhibitor influence establishes a Reinforcing Loop which promotes a drifting of the standard over time. Behaviour of this archetype forces the standard easily change over time and in the result need for change less, resulting in less motivation to initiate a change, which leads to lower overall growth. The standard should be based on objectives that aren't connected to the lower goals caused by the inhibiting factor. The standard is not influenced by the growth inhibitor. The effective strategy is foresigh. Two chefs started a new restaurant business. At the beginning the demand is low and the two are able to provide service at high level. After a while people spoted about new restaurant, good service,food and prices, so in restaurant they have more customers. But the owners are reluctant to add more personnel and equipment and as customers become more, the two of them can't offer the same level of high quality like at the beginning and as their quality falls, demand drops back down. Identify interlocking patterns of behavior between capacity investments and performance measures. Identify delays between when performance falls and when additional capacity comes on line. Quantify and minimize acquisition delays. This page was last edited on 28 December 2016, at 16:02.